Ripple is a real-time gross settlement system (RTGS), currency exchange and remittance network created by Ripple Labs Inc., a US-based technology company. XRP is the native currency of the Ripple ecosystem. Ripple is based around a shared ledger, the XRP Ledger, which uses a consensus process that facilitates for payments, exchanges and remittance in a distributed process. The native token of the ledger is known as XRP, which as of November 2018 was the third largest cryptocurrency by market capitalization. The XRP Ledger applies reserve requirements for every address on the ledger. 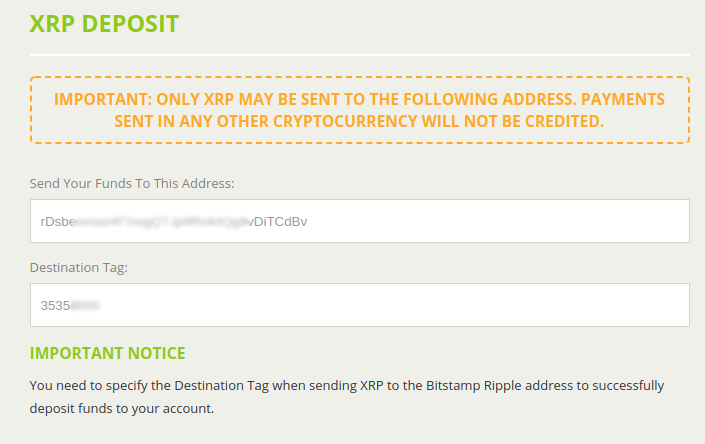 To activate an address and use it to send transactions, the address has to hold the minimum required amount of XRP. ImportantOnce you transfer the minimum reserve amount to a new address, you will not be able to move it elsewhere. Destination tag is a unique identifier intended for the recipient of the transaction. Similar to the "Payment ID" used by Monero or regular "payment reference numbers" one would use in their bank transfers, this number is essential for identifying the origin of the transaction. You have to use the destination tag when sending XRP to exchanges or vendors which need to identify and pair your payment. In these cases, destination tag is provided by the receiving party.